Dash lal just returned from several villages that now have new shelters, thanks to your support. He continues to spend much time going out to the villages and meeting with those who have lost their homes to determine who to provide with shelters. We still have close to $4,000 left for more shelters. Aftershocks continue daily, although lower in frequency and intensity. 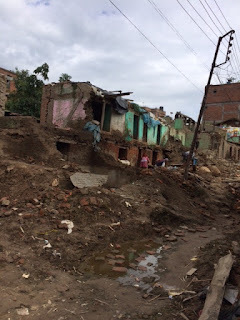 As a result, there has not been much reconstructive work on the homes or monuments yet. 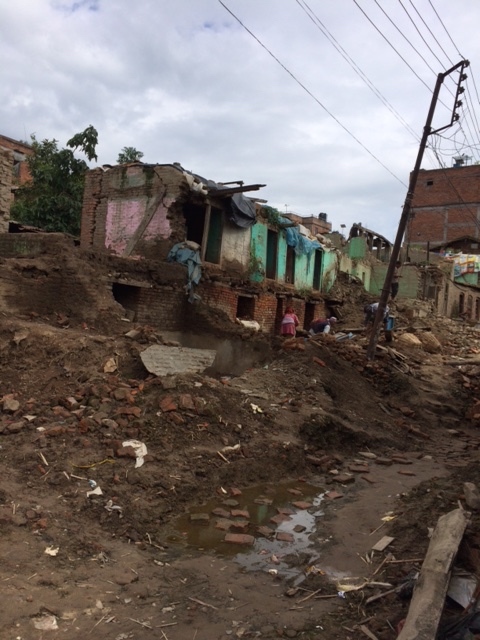 Dash lal spoke with the villagers whose homes (see below) were lost. Taking the sheets to the village. Bina (who lost her home and now has the new shelter) with Dash lal. From start to finish, in one day. Step one. Step two, building the shelter. Shelter is quickly put together. Dash lal with his niece Sonika and one of her family members in front of their new shelter. Dash lal is unflagging in his efforts to be the best steward of your donations, despite some challenging personal situations. His father was recently diagnosed with throat cancer, had to have an emergency tracheotomy, and has been going daily for radiation at the hospital. His father is getting better and can now walk up the stairs himself. Dash lal had to carry him on his back into the hospital early on as well as up three flights of stairs when he brought him home from the treatments. They have gone 25 times for radiation! Because of the earthquake, fresh produce has been scarce and what is available is much more expensive. I told Dash lal to please buy his family some fresh vegetables with money I had sent. 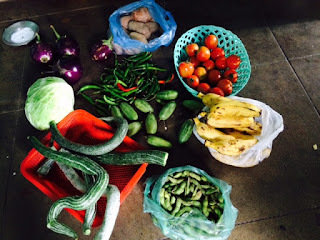 When his wife Sharmila came home with the veggies, he sent me the following picture and said when his 7 year old daughter saw the food, her eyes lit up and she asked if it was a festival day. Thank you again for your support, you are changing the lives of many people.